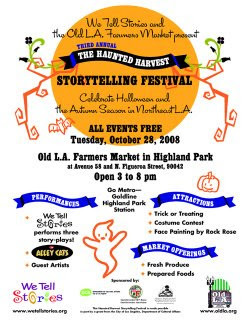 On October 28th from 3:00 PM-8:00 PM, We Tell Stories, LA’s multi-ethnic children’s storytelling theatre company, presents The 3rd Annual Haunted Harvest Storytelling Festival at the Old LA Farmer’s Market in Highland Park located at Avenue 58 and Figueroa Avenue. We Tell Stories will perform three 30-minute story-plays. The Alley Cats, America’s Premier Doo-Wop Group, will perform two 30-minute shows. The Alley Cats perform in schools and venues throughout the country, and often open for Jay Leno. Also featured are famed stilt walkers, Gumplestiltskin, who have performed in festivals all over Southern California. Additional attractions include a costume contest, carved pumpkin contest, face painting, food booths, and a free raffle. This is a free festival, so mark your calendars! Call (323) 256-2336 or click the title link for more info.